The test is done over a 24-hour period of time as you go about your regular daily activities. It is safe and painless. A Holter monitor is a small box the size of a Walkman or transistor radio. It has five small cables attached to electrode patches, which have been placed on your chest. The monitor portion can be attached to your belt or carried ‘purse' like, in a pouch with the strap over your shoulder. The monitor records all the activity of your heart on a magnetic tape. After you return the monitor, the magnetic tape is played back through a machine and the results are reported to your healthcare practitioner. The diagnostic Holter monitor may be scheduled for several reasons. Your doctor may want a record of your chest pain, irregular or fast heart rates, dizziness, or fainting spells. It may also be done to see if a new heart medication you are taking is working properly. 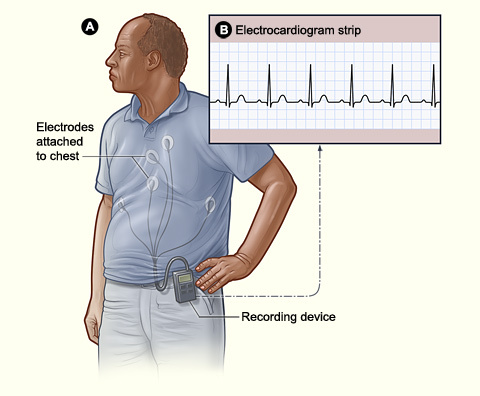 After the monitor is attached, you will be instructed by the EKG technician to go about your normal daily activities. The technician gives a diary to you and you will be asked to keep a record of your activities. Symptoms such as chest pain, shortness of breath, dizziness, or if you feel any irregular beats of your heart should be noted as a diary entry. Please record the TIMES of activities or any symptoms because the monitor has a clock, and the results will be matched up with your diary. Take all your regular medicine as usual. You should not bathe, shower, or get your chest area wet during this 24-hour test. The monitor records on a magnetic tape, so you must not have x-rays during the test as they will interfere with the tape. Your health care provider will be given the results of your test within 1 to 2 weeks. You will be contacted by telephone or a return visit may be scheduled to discuss the results. If you encounter any problems after your test, or if you have any questions, please contact our medical office.